15-3-3-3 Titanium forged Active Beta face insert provides elastic yet high yield strength impacts, resulting in maximum momentum transfer. Larger head size produces high moment of inertia for stability on off center impacts. Optimum center of gravity location for higher launch and optimum spin condition resulting in incredibly controllable soft landing shots. Carefully crafted wide body construction allows for easier airborne launches, low backspin, and straighter and longer shots. I bought an Alpha V5 3 wood and V5 5 wood after trying the C830.4 driver from Alpha. There are no better clubs available. I have been playing for 45 years. Would love to see a side by side test with the big named companies. Alpha would win in distance and accuracy and ease of hitting. And they are beautiful, thank you Alpha. as nice as their clubs, and quick, quality clubs and customer service, I am glad I found them, you will be too. Absolutely the fastest club head I have ever hit!!! High lanche and wonderfull feel. This 3 wood out hits Calloway, Ping, and Taylormade. The look of teh club is awesome. 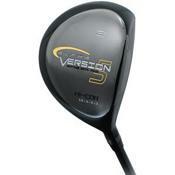 This Alpha v5 hi cor 3 wood is a must have. WOW!! !